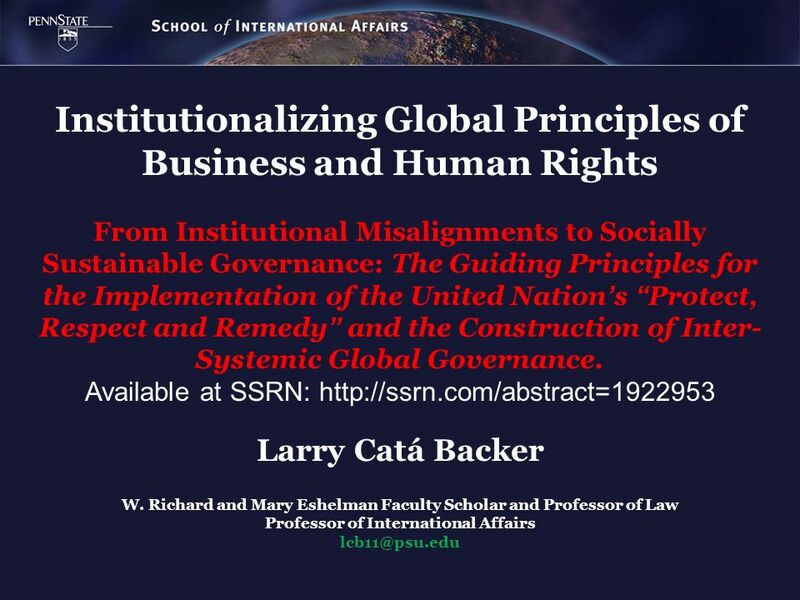 Institutionalizing Global Principles of Business and Human Rights From Institutional Misalignments to Socially Sustainable Governance: The Guiding Principles. 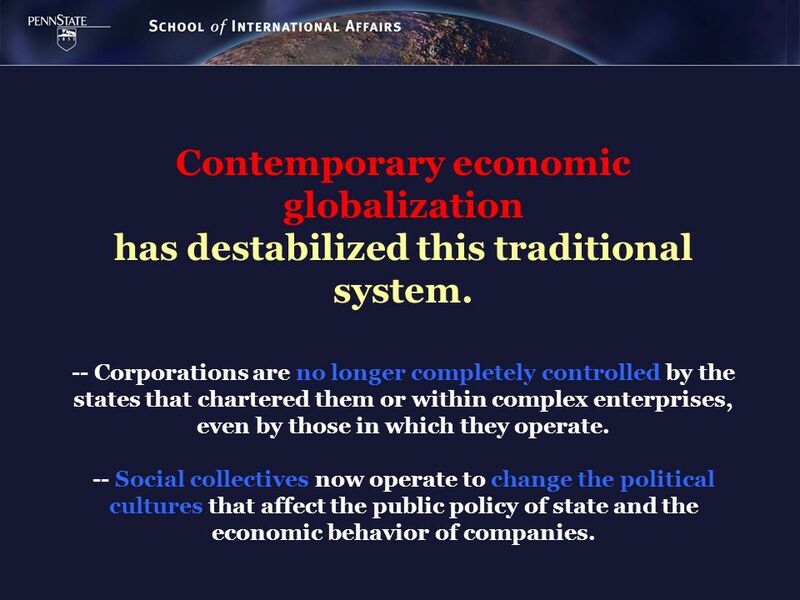 has destabilized this traditional system Corporations are no longer completely controlled by the states that chartered them or within complex enterprises, even by those in which they operate Social collectives now operate to change the political cultures that affect the public policy of state and the economic behavior of companies. 7 OBJECTIVES: --focus on the development of the Guiding Principles from conception to articulation Examine the Guiding Principles in detail. 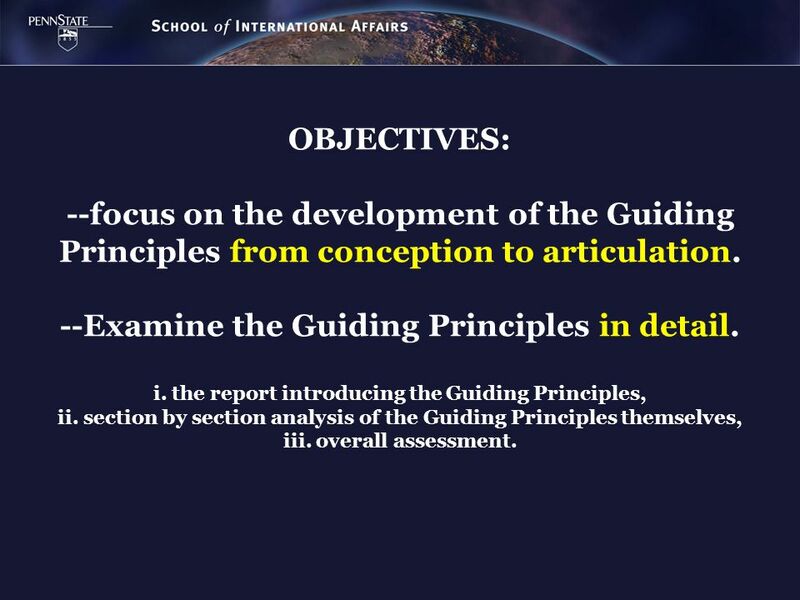 i. the report introducing the Guiding Principles, ii. section by section analysis of the Guiding Principles themselves, iii. overall assessment. 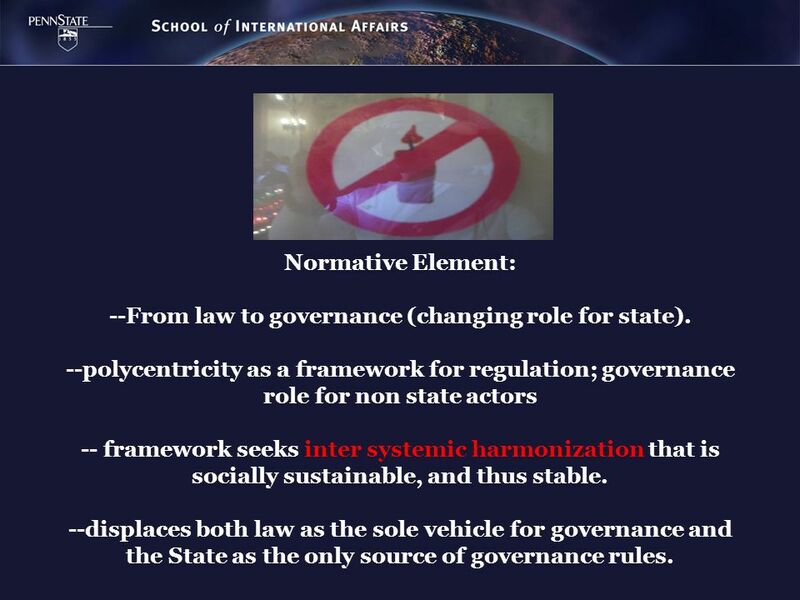 Normative Element: --From law to governance (changing role for state). 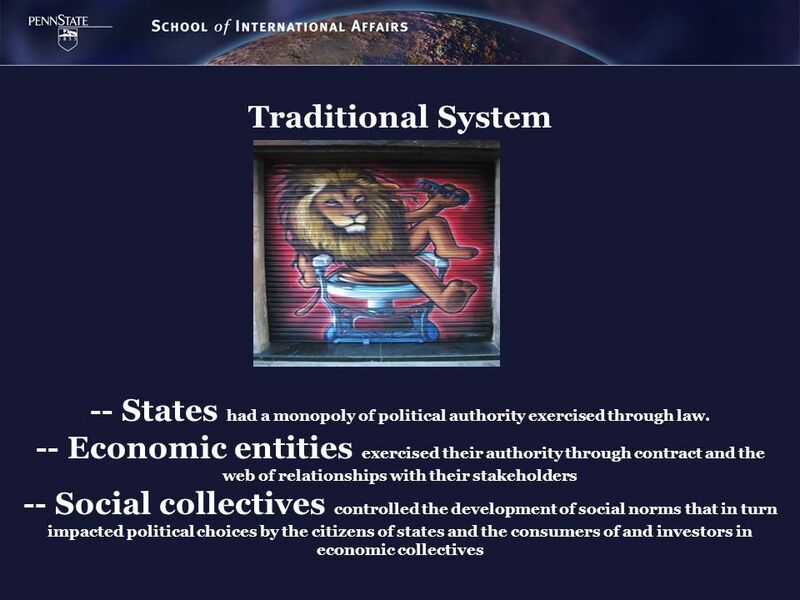 --polycentricity as a framework for regulation; governance role for non state actors -- framework seeks inter systemic harmonization that is socially sustainable, and thus stable. --displaces both law as the sole vehicle for governance and the State as the only source of governance rules. 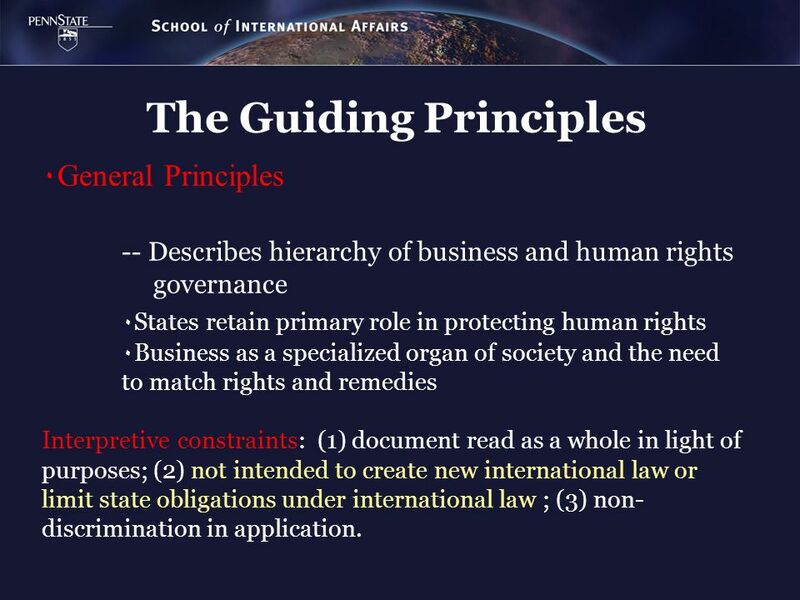 ٠General Principles -- Describes hierarchy of business and human rights governance ٠States retain primary role in protecting human rights ٠Business as a specialized organ of society and the need to match rights and remedies Interpretive constraints: (1) document read as a whole in light of purposes; (2) not intended to create new international law or limit state obligations under international law ; (3) non- discrimination in application. 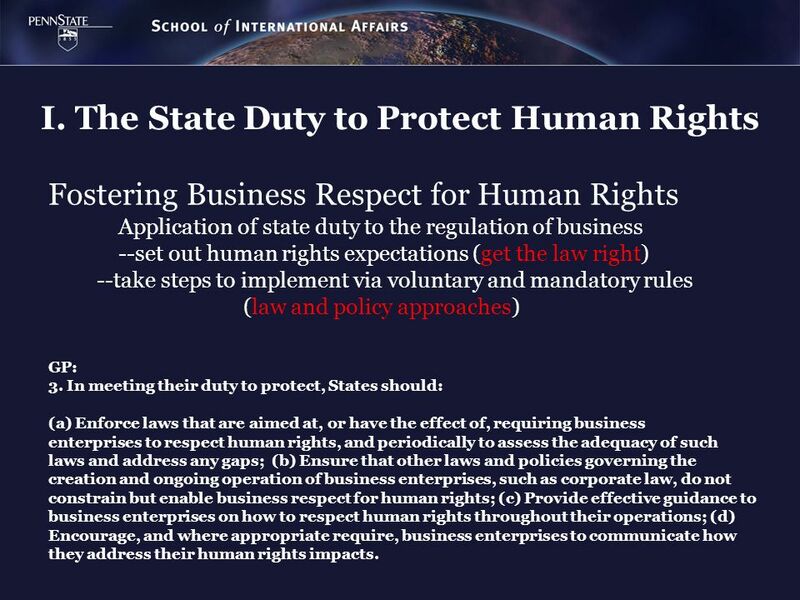 Fostering Business Respect for Human Rights Application of state duty to the regulation of business set out human rights expectations (get the law right) take steps to implement via voluntary and mandatory rules (law and policy approaches) GP: 3. In meeting their duty to protect, States should: (a) Enforce laws that are aimed at, or have the effect of, requiring business enterprises to respect human rights, and periodically to assess the adequacy of such laws and address any gaps; (b) Ensure that other laws and policies governing the creation and ongoing operation of business enterprises, such as corporate law, do not constrain but enable business respect for human rights; (c) Provide effective guidance to business enterprises on how to respect human rights throughout their operations; (d) Encourage, and where appropriate require, business enterprises to communicate how they address their human rights impacts. The State-Business Nexus Detail Detail Detail State Owned Enterprises/State Financing Programs Outsourced Services Business Partners GP: 4. 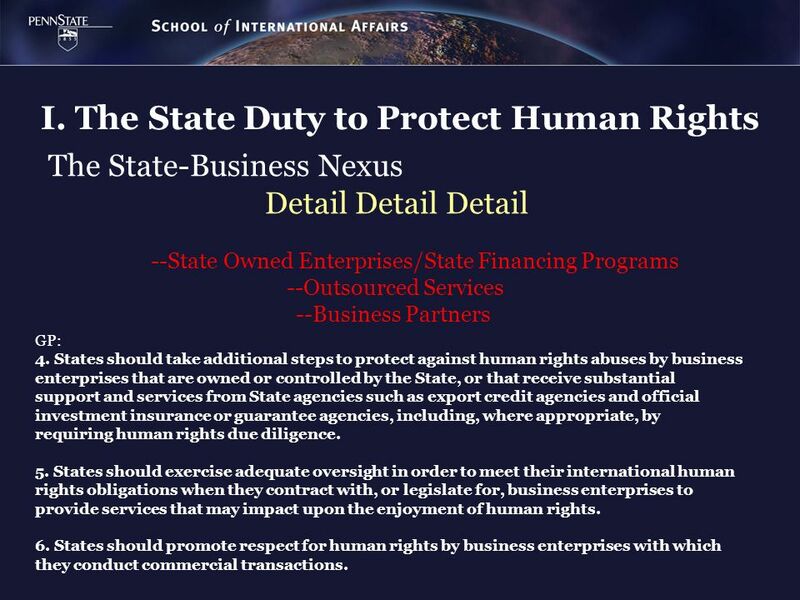 States should take additional steps to protect against human rights abuses by business enterprises that are owned or controlled by the State, or that receive substantial support and services from State agencies such as export credit agencies and official investment insurance or guarantee agencies, including, where appropriate, by requiring human rights due diligence. 5. 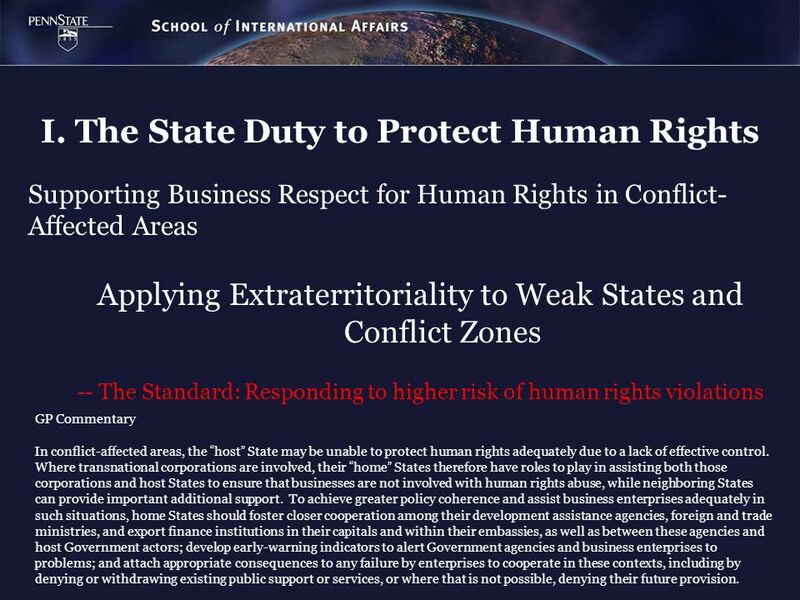 States should exercise adequate oversight in order to meet their international human rights obligations when they contract with, or legislate for, business enterprises to provide services that may impact upon the enjoyment of human rights. 6. States should promote respect for human rights by business enterprises with which they conduct commercial transactions. 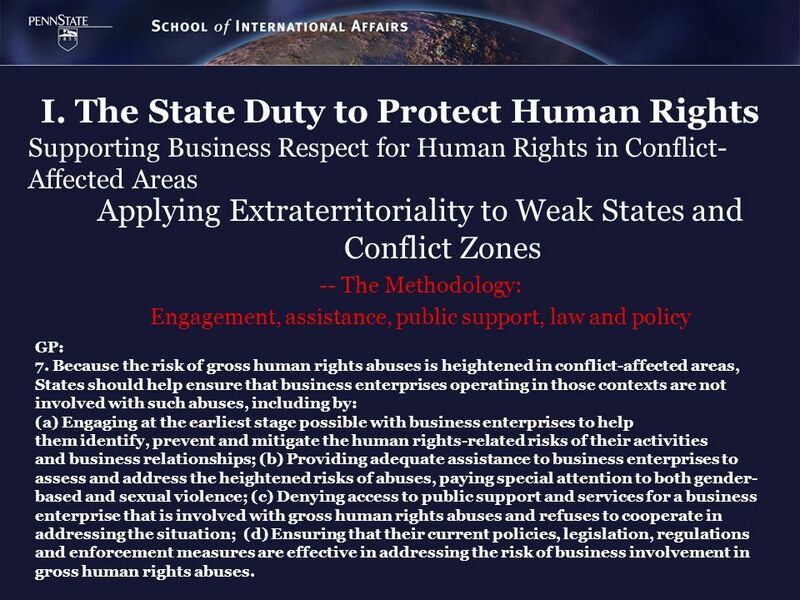 Supporting Business Respect for Human Rights in Conflict-Affected Areas Applying Extraterritoriality to Weak States and Conflict Zones -- The Methodology: Engagement, assistance, public support, law and policy GP: 7. Because the risk of gross human rights abuses is heightened in conflict-affected areas, States should help ensure that business enterprises operating in those contexts are not involved with such abuses, including by: (a) Engaging at the earliest stage possible with business enterprises to help them identify, prevent and mitigate the human rights-related risks of their activities and business relationships; (b) Providing adequate assistance to business enterprises to assess and address the heightened risks of abuses, paying special attention to both gender-based and sexual violence; (c) Denying access to public support and services for a business enterprise that is involved with gross human rights abuses and refuses to cooperate in addressing the situation; (d) Ensuring that their current policies, legislation, regulations and enforcement measures are effective in addressing the risk of business involvement in gross human rights abuses. Supporting Business Respect for Human Rights in Conflict-Affected Areas Applying Extraterritoriality to Weak States and Conflict Zones -- The Standard: Responding to higher risk of human rights violations GP Commentary In conflict-affected areas, the “host” State may be unable to protect human rights adequately due to a lack of effective control. 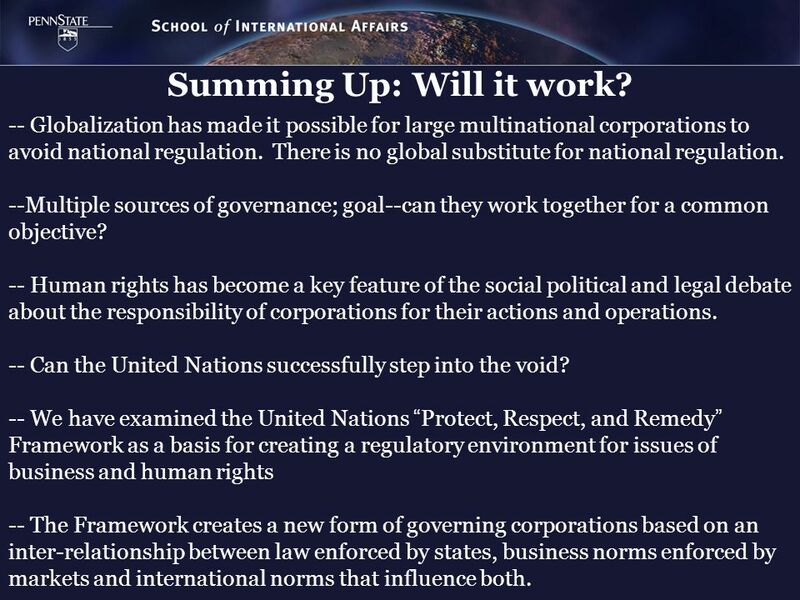 Where transnational corporations are involved, their “home” States therefore have roles to play in assisting both those corporations and host States to ensure that businesses are not involved with human rights abuse, while neighboring States can provide important additional support. To achieve greater policy coherence and assist business enterprises adequately in such situations, home States should foster closer cooperation among their development assistance agencies, foreign and trade ministries, and export finance institutions in their capitals and within their embassies, as well as between these agencies and host Government actors; develop early-warning indicators to alert Government agencies and business enterprises to problems; and attach appropriate consequences to any failure by enterprises to cooperate in these contexts, including by denying or withdrawing existing public support or services, or where that is not possible, denying their future provision. 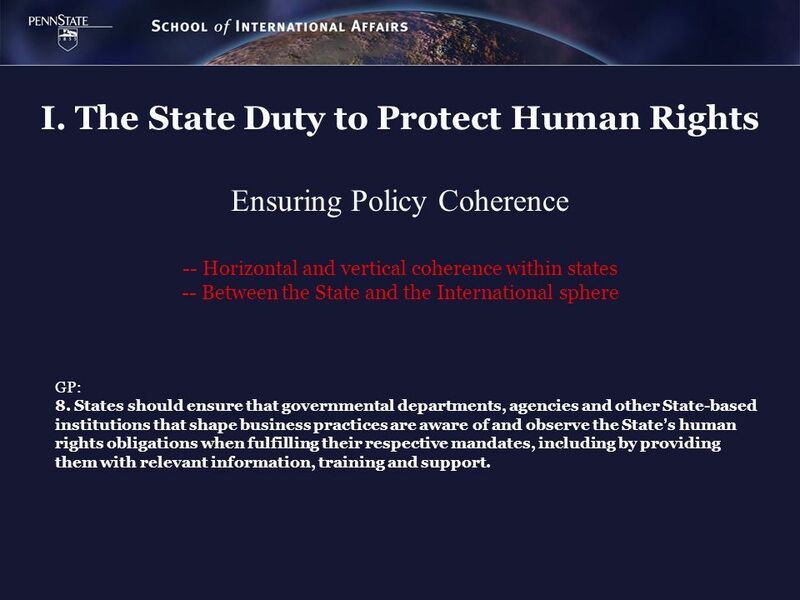 Ensuring Policy Coherence Horizontal and vertical coherence within states -- Between the State and the International sphere GP: 8. States should ensure that governmental departments, agencies and other State-based institutions that shape business practices are aware of and observe the State’s human rights obligations when fulfilling their respective mandates, including by providing them with relevant information, training and support. 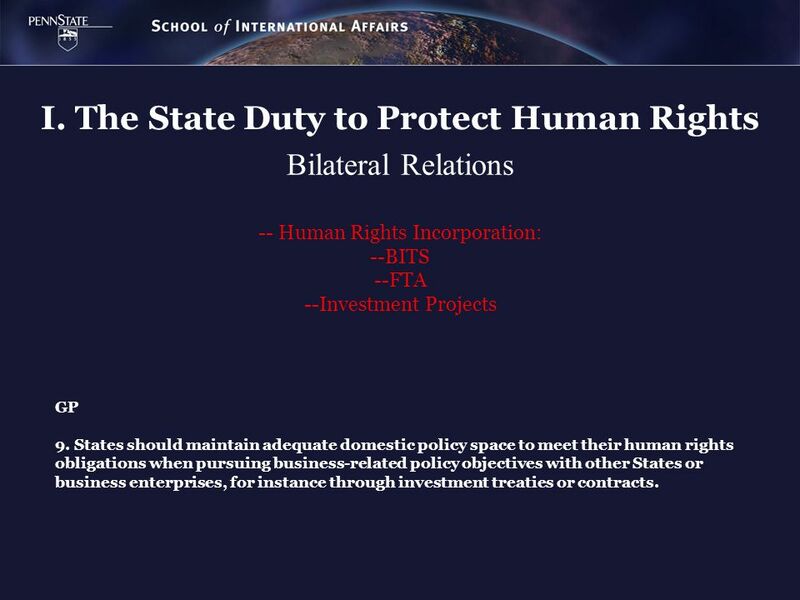 Bilateral Relations -- Human Rights Incorporation: --BITS --FTA --Investment Projects GP 9. 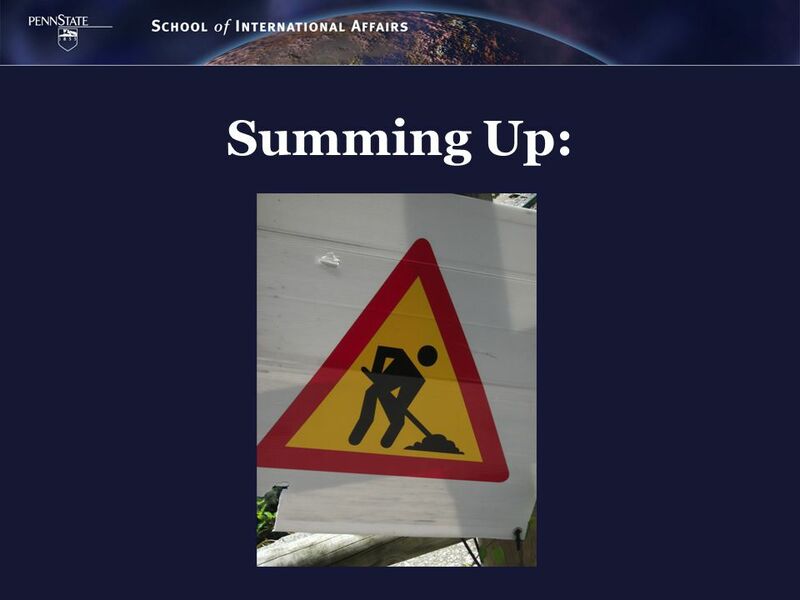 States should maintain adequate domestic policy space to meet their human rights obligations when pursuing business-related policy objectives with other States or business enterprises, for instance through investment treaties or contracts. I. 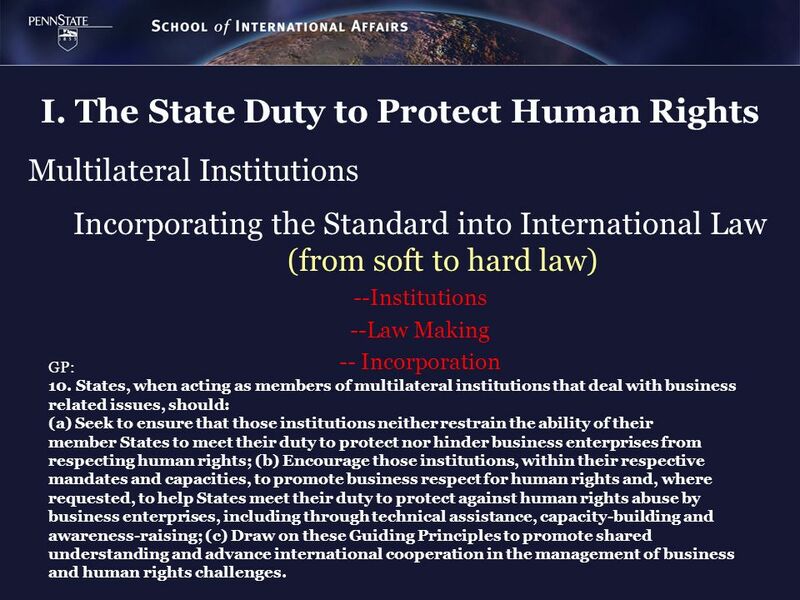 The State Duty to Protect Human Rights Multilateral Institutions Incorporating the Standard into International Law (from soft to hard law) --Institutions --Law Making -- Incorporation GP: 10. 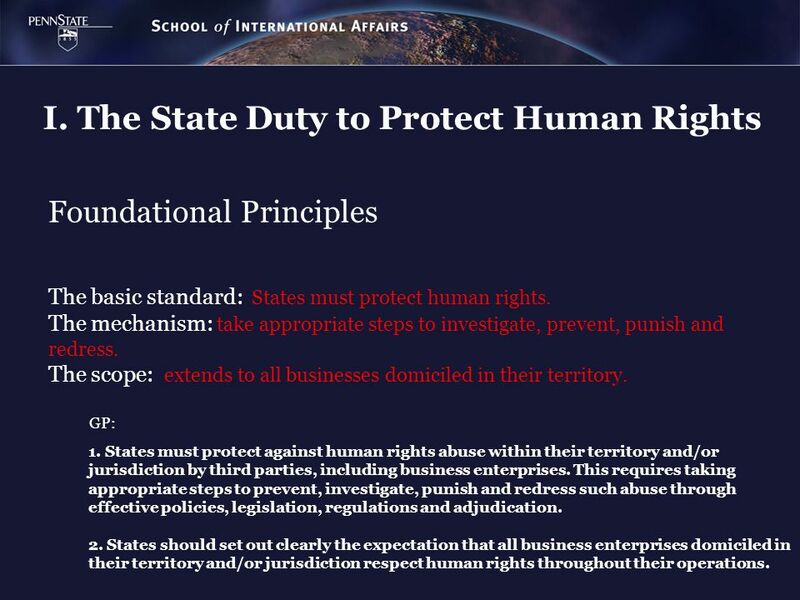 States, when acting as members of multilateral institutions that deal with business related issues, should: (a) Seek to ensure that those institutions neither restrain the ability of their member States to meet their duty to protect nor hinder business enterprises from respecting human rights; (b) Encourage those institutions, within their respective mandates and capacities, to promote business respect for human rights and, where requested, to help States meet their duty to protect against human rights abuse by business enterprises, including through technical assistance, capacity-building and awareness-raising; (c) Draw on these Guiding Principles to promote shared understanding and advance international cooperation in the management of business and human rights challenges. II. 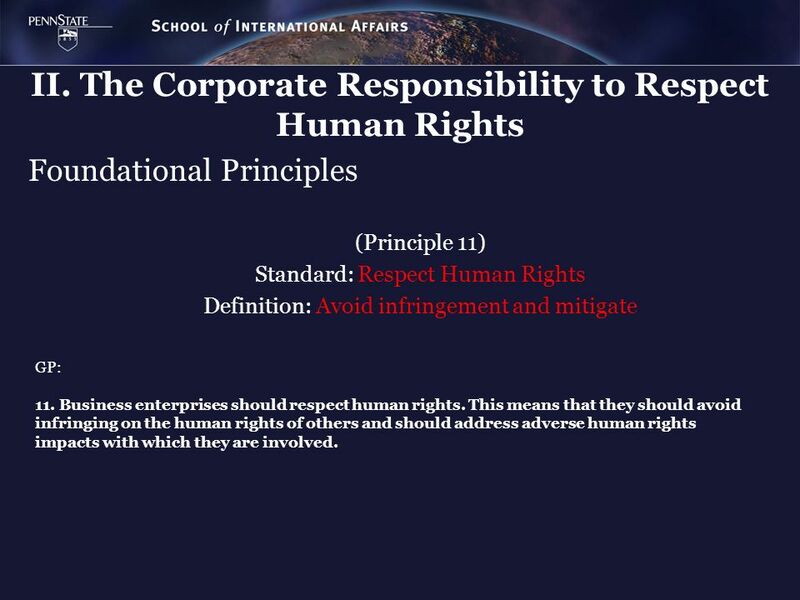 The Corporate Responsibility to Respect Human Rights Foundational Principles (Principle 11) Standard: Respect Human Rights Definition: Avoid infringement and mitigate GP: 11. Business enterprises should respect human rights. This means that they should avoid infringing on the human rights of others and should address adverse human rights impacts with which they are involved. II. 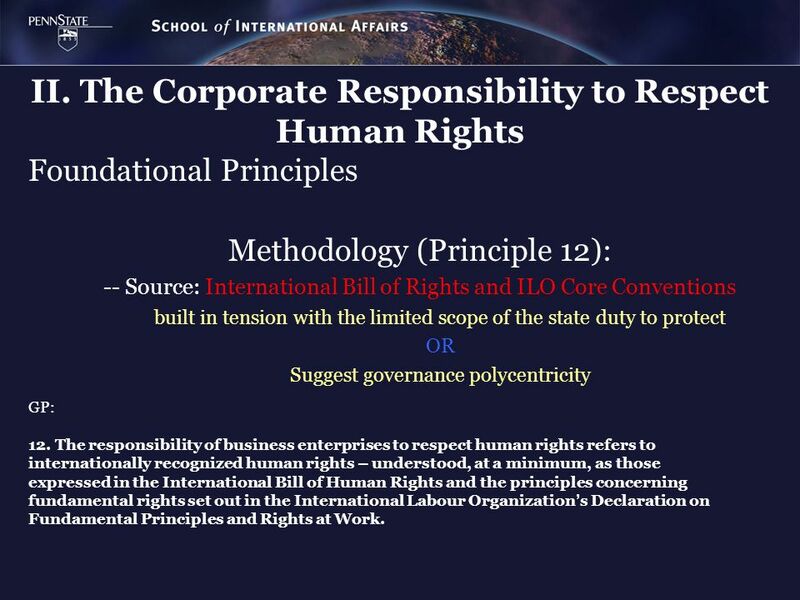 The Corporate Responsibility to Respect Human Rights Foundational Principles Methodology (Principle 12): -- Source: International Bill of Rights and ILO Core Conventions built in tension with the limited scope of the state duty to protect OR Suggest governance polycentricity GP: 12. 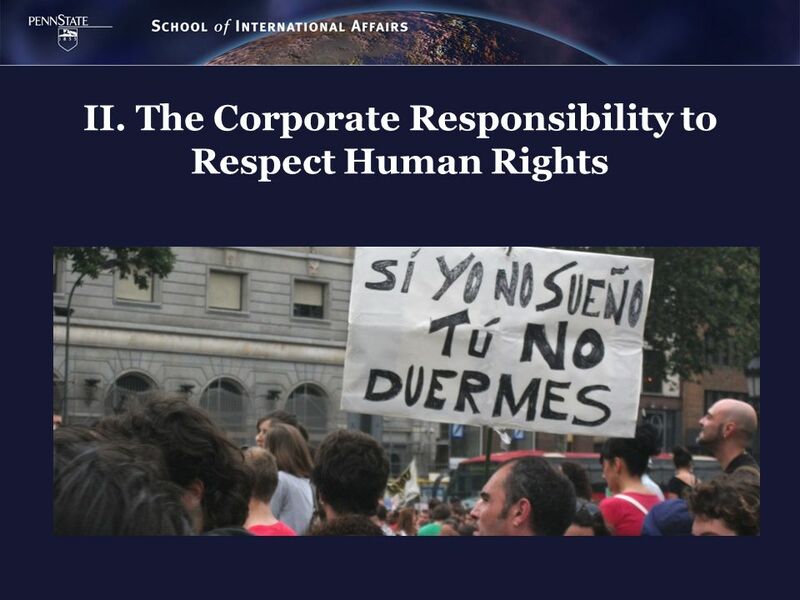 The responsibility of business enterprises to respect human rights refers to internationally recognized human rights – understood, at a minimum, as those expressed in the International Bill of Human Rights and the principles concerning fundamental rights set out in the International Labour Organization’s Declaration on Fundamental Principles and Rights at Work. II. 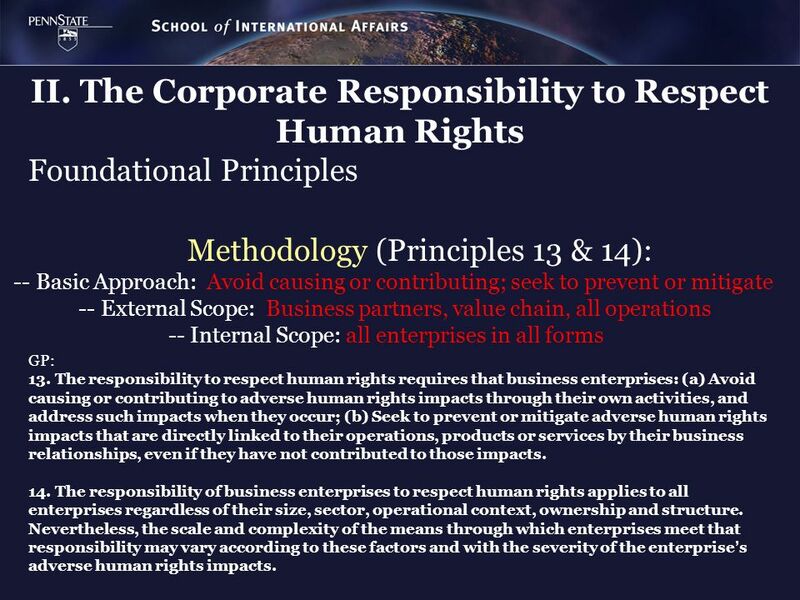 The Corporate Responsibility to Respect Human Rights Foundational Principles Methodology (Principles 13 & 14): -- Basic Approach: Avoid causing or contributing; seek to prevent or mitigate -- External Scope: Business partners, value chain, all operations -- Internal Scope: all enterprises in all forms GP: 13. The responsibility to respect human rights requires that business enterprises: (a) Avoid causing or contributing to adverse human rights impacts through their own activities, and address such impacts when they occur; (b) Seek to prevent or mitigate adverse human rights impacts that are directly linked to their operations, products or services by their business relationships, even if they have not contributed to those impacts. 14. The responsibility of business enterprises to respect human rights applies to all enterprises regardless of their size, sector, operational context, ownership and structure. Nevertheless, the scale and complexity of the means through which enterprises meet that responsibility may vary according to these factors and with the severity of the enterprise’s adverse human rights impacts. II. 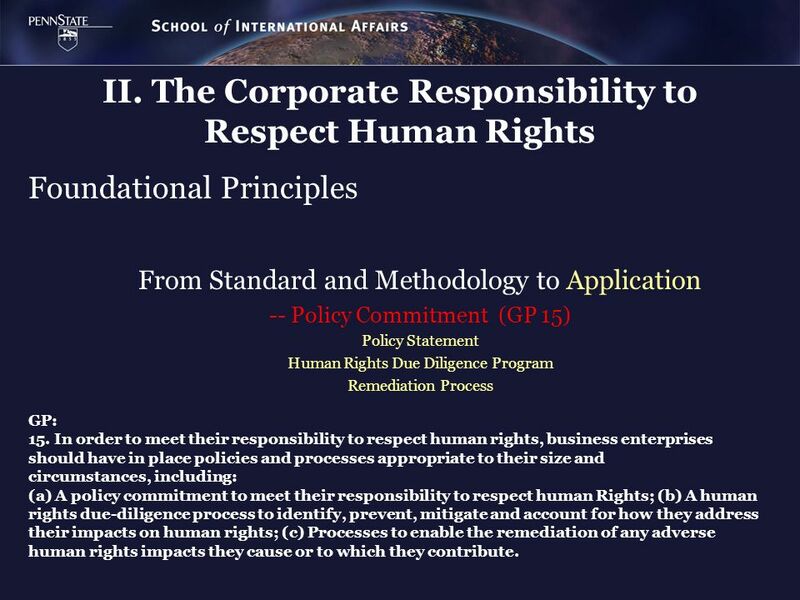 The Corporate Responsibility to Respect Human Rights Foundational Principles From Standard and Methodology to Application -- Policy Commitment (GP 15) Policy Statement Human Rights Due Diligence Program Remediation Process GP: 15. In order to meet their responsibility to respect human rights, business enterprises should have in place policies and processes appropriate to their size and circumstances, including: (a) A policy commitment to meet their responsibility to respect human Rights; (b) A human rights due-diligence process to identify, prevent, mitigate and account for how they address their impacts on human rights; (c) Processes to enable the remediation of any adverse human rights impacts they cause or to which they contribute. Policy Commitment The Policy Statement (GP 16) -- Form & Content Senior level buy-in External Expertise Universal Imbedding Publically Available GP: 16. 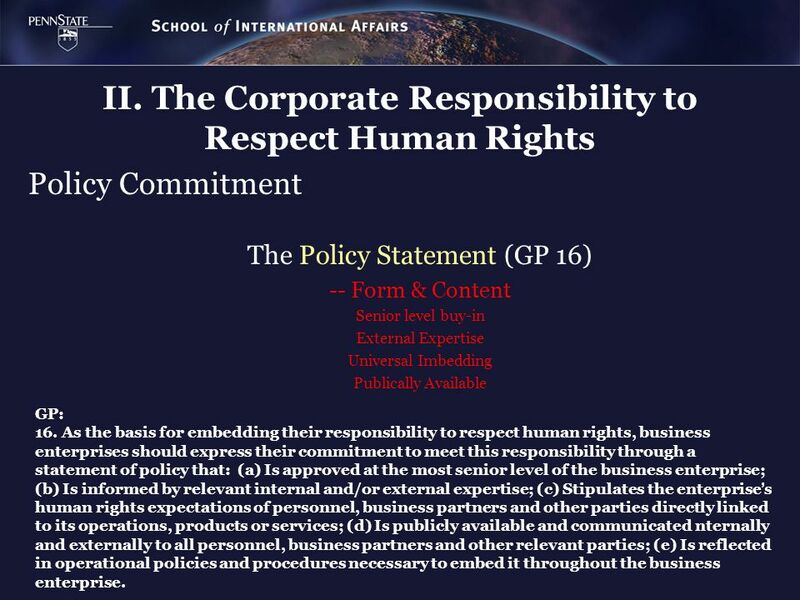 As the basis for embedding their responsibility to respect human rights, business enterprises should express their commitment to meet this responsibility through a statement of policy that: (a) Is approved at the most senior level of the business enterprise; (b) Is informed by relevant internal and/or external expertise; (c) Stipulates the enterprise’s human rights expectations of personnel, business partners and other parties directly linked to its operations, products or services; (d) Is publicly available and communicated nternally and externally to all personnel, business partners and other relevant parties; (e) Is reflected in operational policies and procedures necessary to embed it throughout the business enterprise. II. 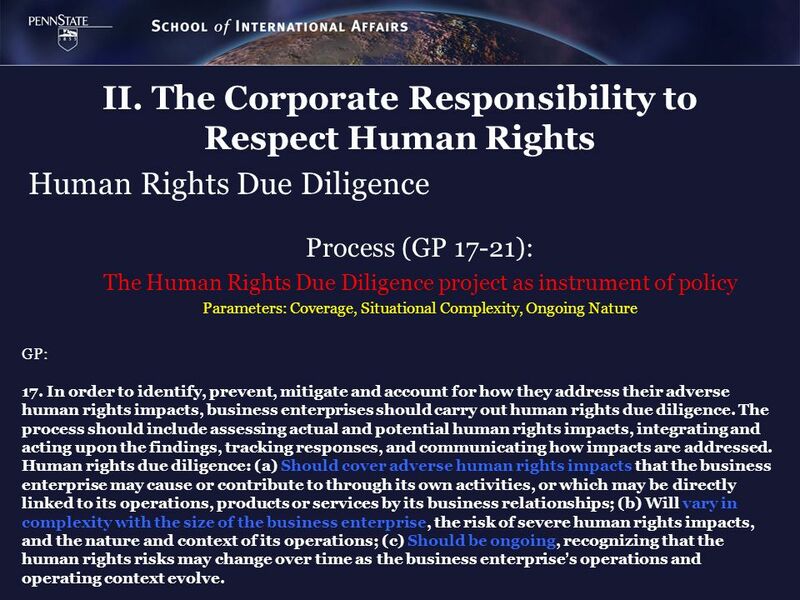 The Corporate Responsibility to Respect Human Rights Human Rights Due Diligence Process (GP 17-21): The Human Rights Due Diligence project as instrument of policy Parameters: Coverage, Situational Complexity, Ongoing Nature GP: 17. In order to identify, prevent, mitigate and account for how they address their adverse human rights impacts, business enterprises should carry out human rights due diligence. The process should include assessing actual and potential human rights impacts, integrating and acting upon the findings, tracking responses, and communicating how impacts are addressed. Human rights due diligence: (a) Should cover adverse human rights impacts that the business enterprise may cause or contribute to through its own activities, or which may be directly linked to its operations, products or services by its business relationships; (b) Will vary in complexity with the size of the business enterprise, the risk of severe human rights impacts, and the nature and context of its operations; (c) Should be ongoing, recognizing that the human rights risks may change over time as the business enterprise’s operations and operating context evolve. II. 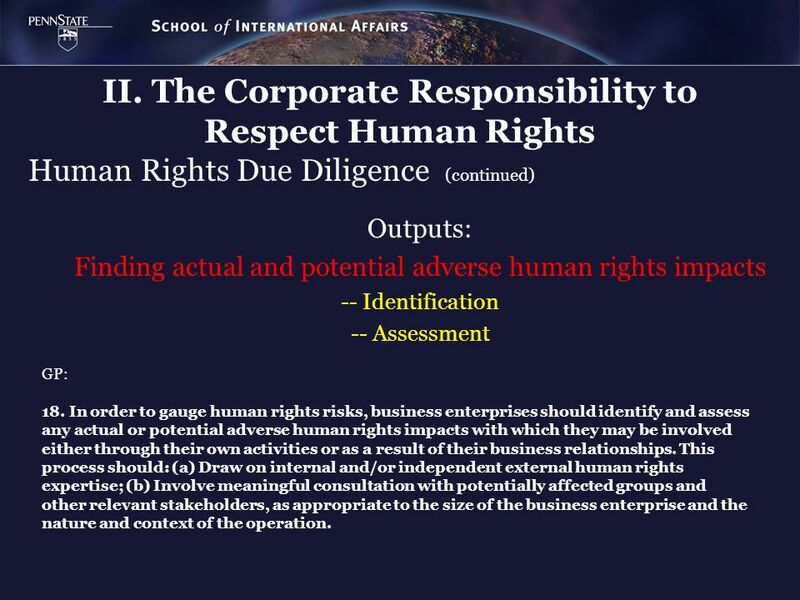 The Corporate Responsibility to Respect Human Rights Outputs: Finding actual and potential adverse human rights impacts -- Identification -- Assessment Human Rights Due Diligence (continued) GP: 18. In order to gauge human rights risks, business enterprises should identify and assess any actual or potential adverse human rights impacts with which they may be involved either through their own activities or as a result of their business relationships. 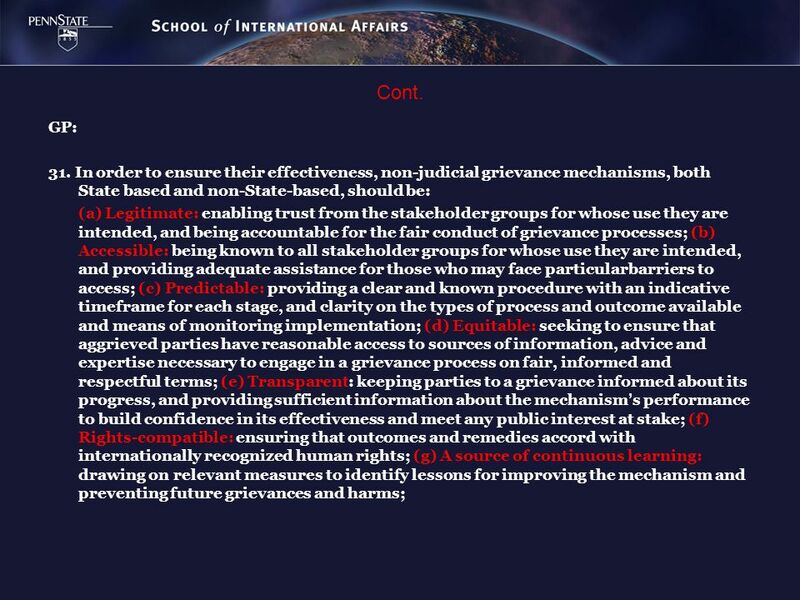 This process should: (a) Draw on internal and/or independent external human rights expertise; (b) Involve meaningful consultation with potentially affected groups and other relevant stakeholders, as appropriate to the size of the business enterprise and the nature and context of the operation. II. 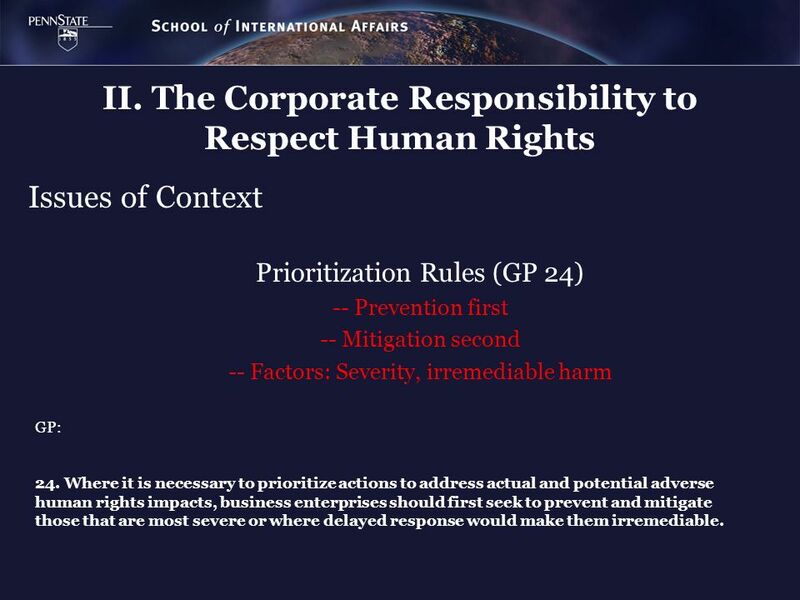 The Corporate Responsibility to Respect Human Rights From Outputs to Action: -- Prevention -- Mitigation Human Rights Due Diligence (continued) GP: 19. In order to prevent and mitigate adverse human rights impacts, business enterprises should integrate the findings from their impact assessments across relevant internal functions and processes, and take appropriate action. Effective integration requires that: (i) Responsibility for addressing such impacts is assigned to the appropriate level and function within the business enterprise; (ii) Internal decision-making, budget allocations and oversight processes enable effective responses to such impacts. Appropriate action will vary according to: (i) Whether the business enterprise causes or contributes to an adverse impact, or whether it is involved solely because the impact is directly linked to its operations, products or services by a business relationship; (ii) The extent of its leverage in addressing the adverse impact. II. The Corporate Responsibility to Respect Human Rights Disclosure Obligations (GP 20 & 21): Verification Monitoring Transparency Reporting Human Rights Due Diligence (continued) GP: 20. In order to verify whether adverse human rights impacts are being addressed, business enterprises should track the effectiveness of their response. Tracking should: (a) Be based on appropriate qualitative and quantitative indicators; (b) Draw on feedback from both internal and external sources, including affected stakeholders. 21. In order to account for how they address their human rights impacts, business enterprises should be prepared to communicate this externally, particularly when concerns are raised by or on behalf of affected stakeholders. Business enterprises whose operations or operating contexts pose risks of severe human rights impacts should report formally on how they address them. In all instances, communications should: (a) Be of a form and frequency that reflect an enterprise’s human rights impacts and that are accessible to its intended audiences; (b) Provide information that is sufficient to evaluate the adequacy of an enterprise’s response to the particular human rights impact involved; (c) In turn not pose risks to affected stakeholders, personnel or to legitimate requirements of commercial confidentiality. Remediation Basic Standard (GP 22) -- Fundamental Connection: Impact/Remediation -- Link to GP31 GP: 22. Where business enterprises identify that they have caused or contributed to adverse impacts, they should provide for or cooperate in their remediation through legitimate processes. 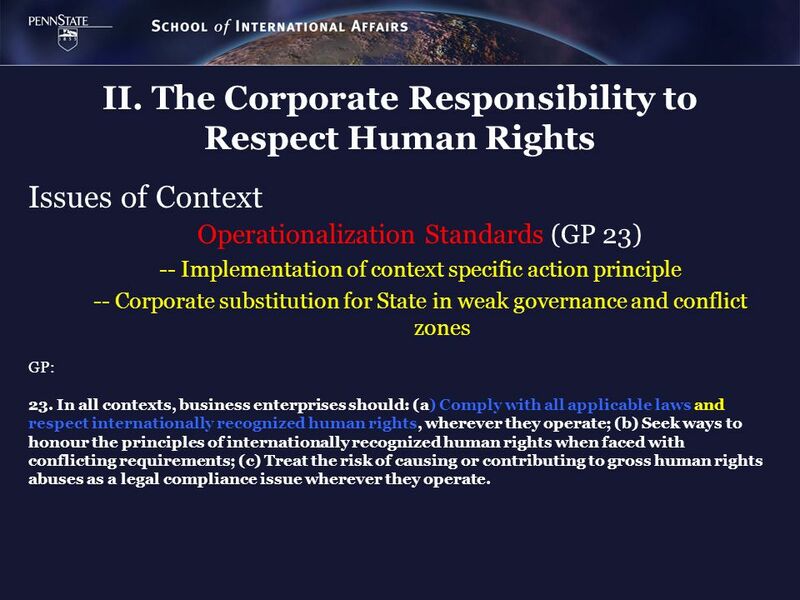 Issues of Context Operationalization Standards (GP 23) -- Implementation of context specific action principle -- Corporate substitution for State in weak governance and conflict zones GP: 23. 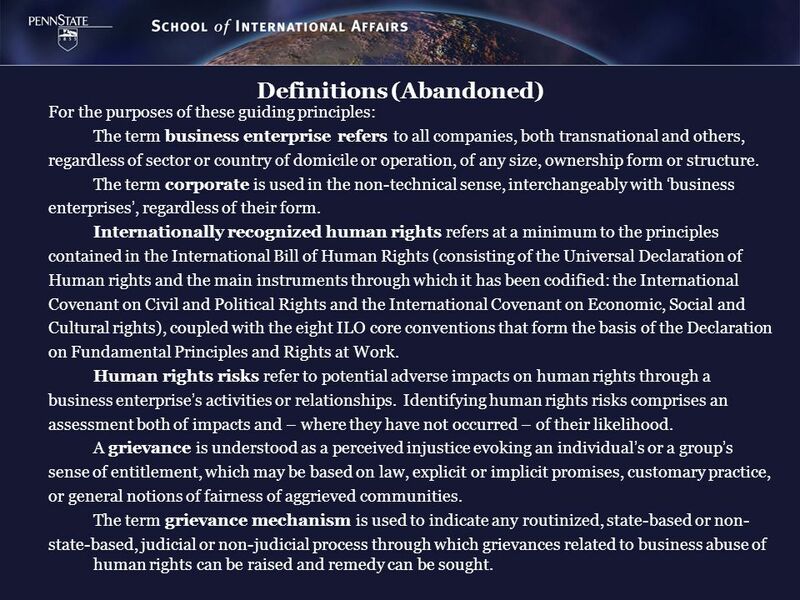 In all contexts, business enterprises should: (a) Comply with all applicable laws and respect internationally recognized human rights, wherever they operate; (b) Seek ways to honour the principles of internationally recognized human rights when faced with conflicting requirements; (c) Treat the risk of causing or contributing to gross human rights abuses as a legal compliance issue wherever they operate. Issues of Context Prioritization Rules (GP 24) -- Prevention first -- Mitigation second -- Factors: Severity, irremediable harm GP: 24. 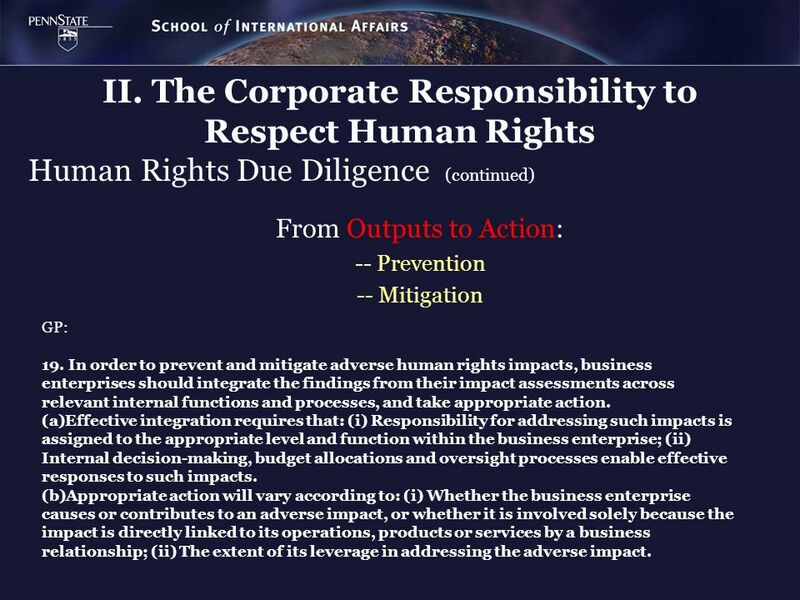 Where it is necessary to prioritize actions to address actual and potential adverse human rights impacts, business enterprises should first seek to prevent and mitigate those that are most severe or where delayed response would make them irremediable. III. 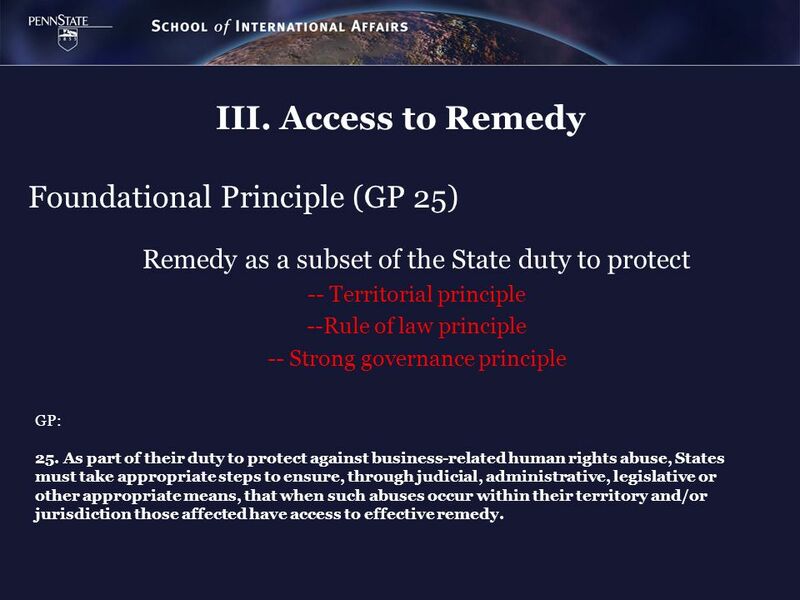 Access to Remedy Foundational Principle (GP 25) Remedy as a subset of the State duty to protect -- Territorial principle --Rule of law principle -- Strong governance principle GP: 25. As part of their duty to protect against business-related human rights abuse, States must take appropriate steps to ensure, through judicial, administrative, legislative or other appropriate means, that when such abuses occur within their territory and/or jurisdiction those affected have access to effective remedy. III. 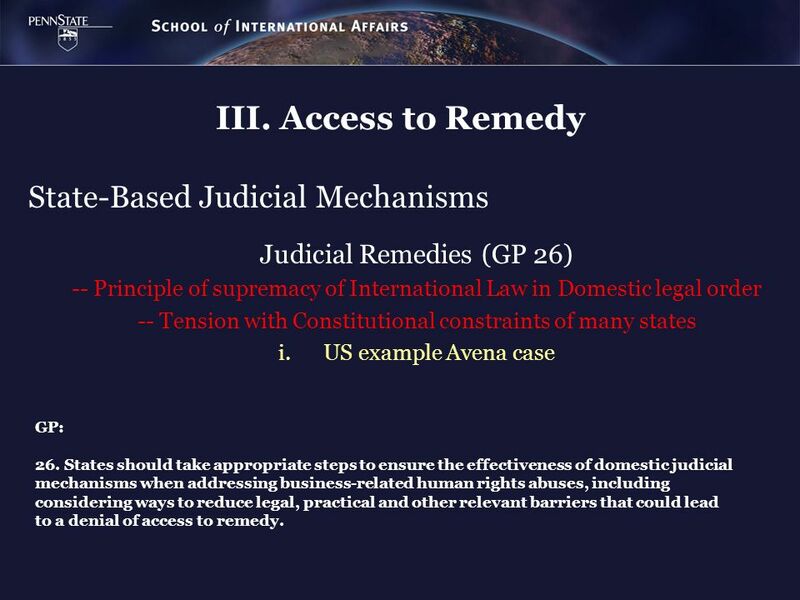 Access to Remedy State-Based Judicial Mechanisms Judicial Remedies (GP 26) -- Principle of supremacy of International Law in Domestic legal order -- Tension with Constitutional constraints of many states US example Avena case GP: 26. States should take appropriate steps to ensure the effectiveness of domestic judicial mechanisms when addressing business-related human rights abuses, including considering ways to reduce legal, practical and other relevant barriers that could lead to a denial of access to remedy. III. 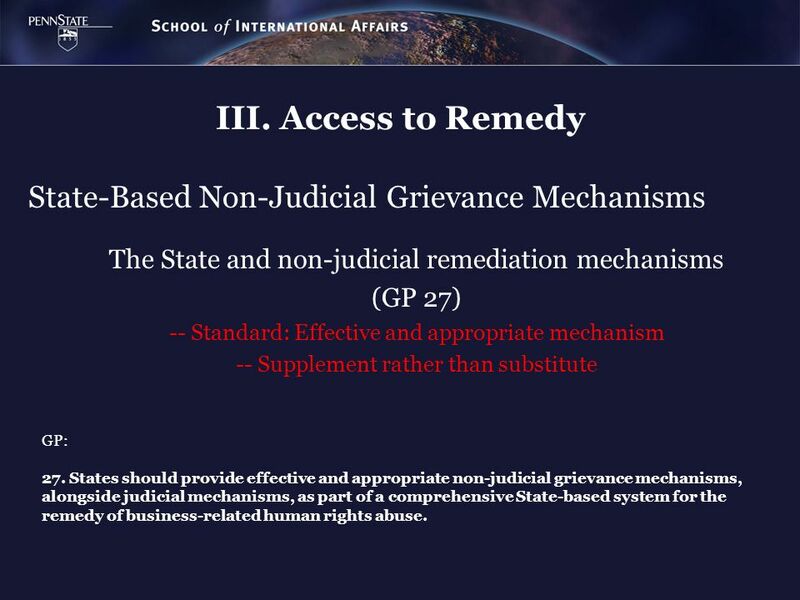 Access to Remedy State-Based Non-Judicial Grievance Mechanisms The State and non-judicial remediation mechanisms (GP 27) -- Standard: Effective and appropriate mechanism -- Supplement rather than substitute GP: 27. States should provide effective and appropriate non-judicial grievance mechanisms, alongside judicial mechanisms, as part of a comprehensive State-based system for the remedy of business-related human rights abuse. III. 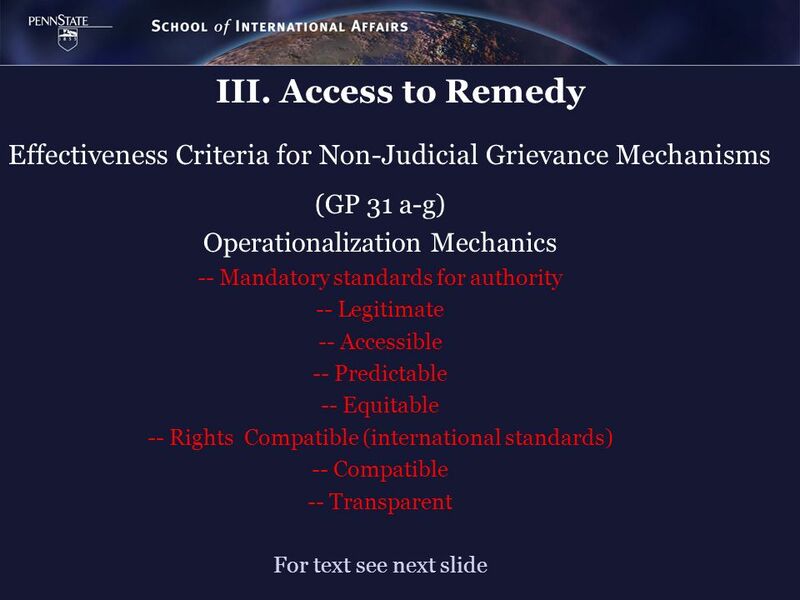 Access to Remedy Non-State-Based Grievance Mechanisms (GP 28-29)State involvement in business based remedial mechanisms Operational level grievance mechanism as supplement -- Subordination of Corporate Responsibility to State duty -- Supplemental not substitute for either judicial or non-judicial state based remedies; focus on avoidance of harm GP: 28. 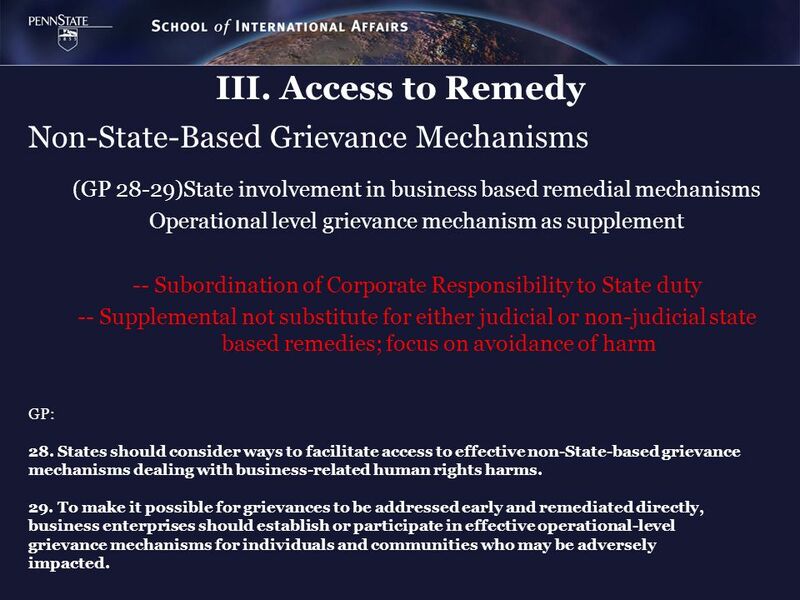 States should consider ways to facilitate access to effective non-State-based grievance mechanisms dealing with business-related human rights harms. 29. 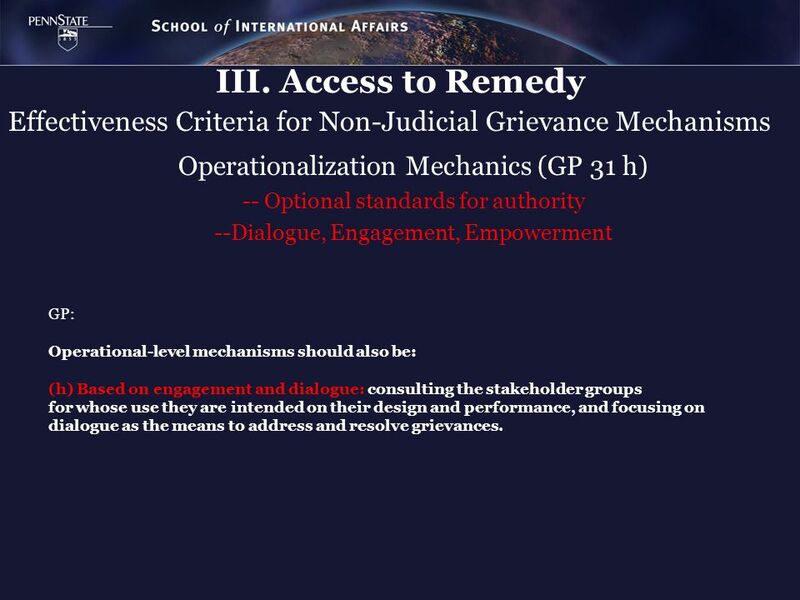 To make it possible for grievances to be addressed early and remediated directly, business enterprises should establish or participate in effective operational-level grievance mechanisms for individuals and communities who may be adversely impacted. III. 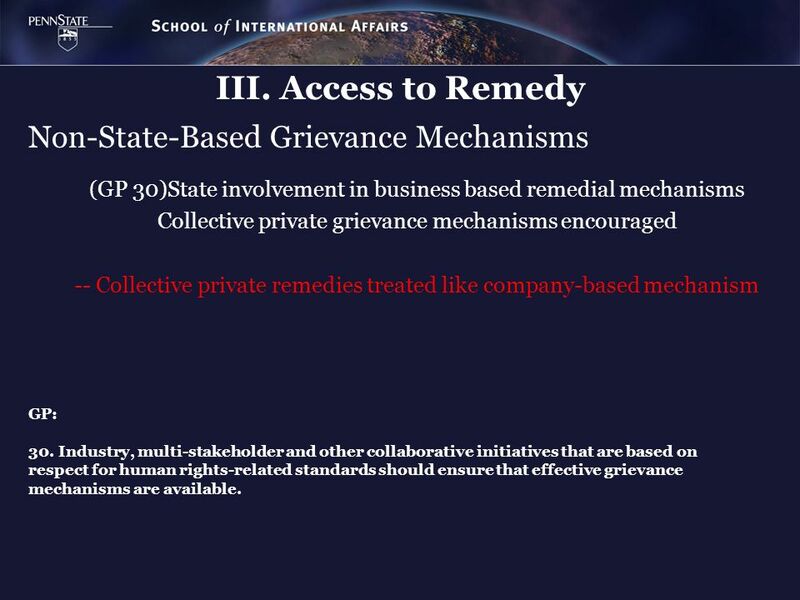 Access to Remedy Non-State-Based Grievance Mechanisms (GP 30)State involvement in business based remedial mechanisms Collective private grievance mechanisms encouraged -- Collective private remedies treated like company-based mechanism GP: 30. Industry, multi-stakeholder and other collaborative initiatives that are based on respect for human rights-related standards should ensure that effective grievance mechanisms are available. III. 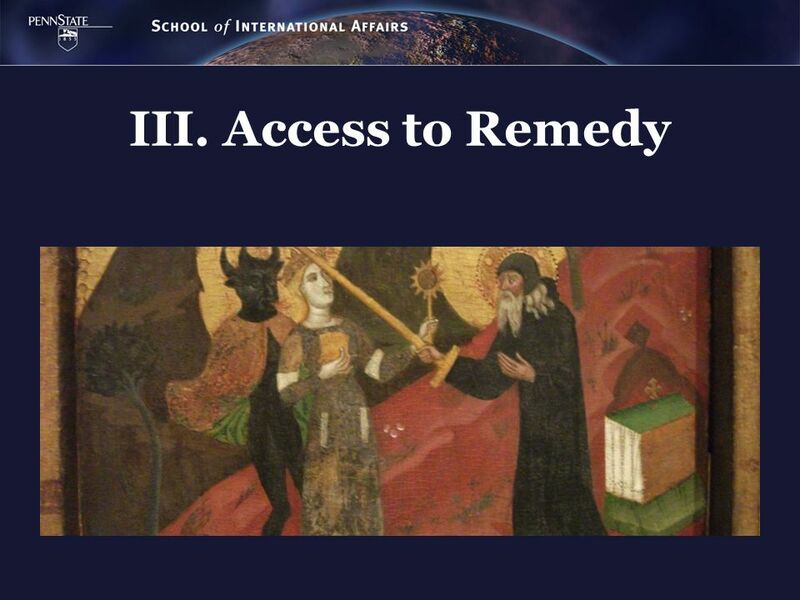 Access to Remedy Effectiveness Criteria for Non-Judicial Grievance Mechanisms Operationalization Mechanics (GP 31 h) -- Optional standards for authority --Dialogue, Engagement, Empowerment GP: Operational-level mechanisms should also be: (h) Based on engagement and dialogue: consulting the stakeholder groups for whose use they are intended on their design and performance, and focusing on dialogue as the means to address and resolve grievances. 42 Summing Up: Will it work? -- Globalization has made it possible for large multinational corporations to avoid national regulation. There is no global substitute for national regulation. 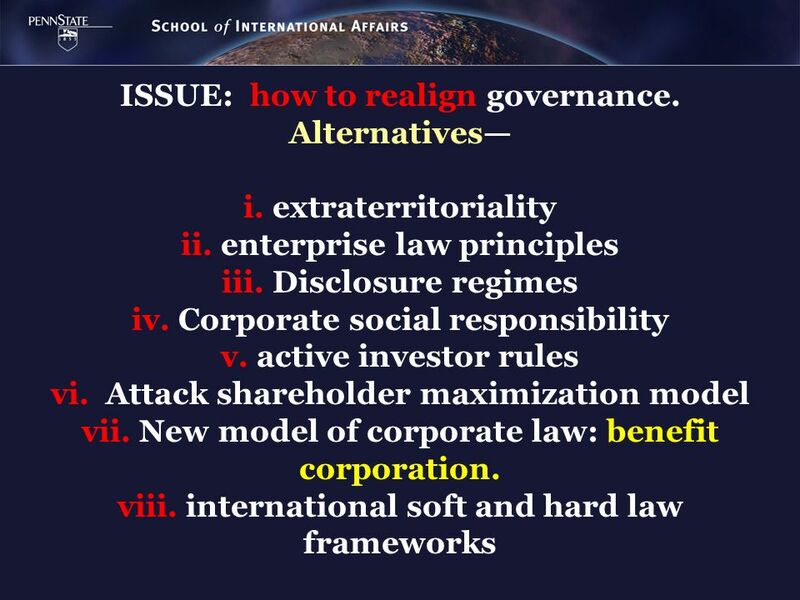 --Multiple sources of governance; goal--can they work together for a common objective? -- Human rights has become a key feature of the social political and legal debate about the responsibility of corporations for their actions and operations. -- Can the United Nations successfully step into the void? 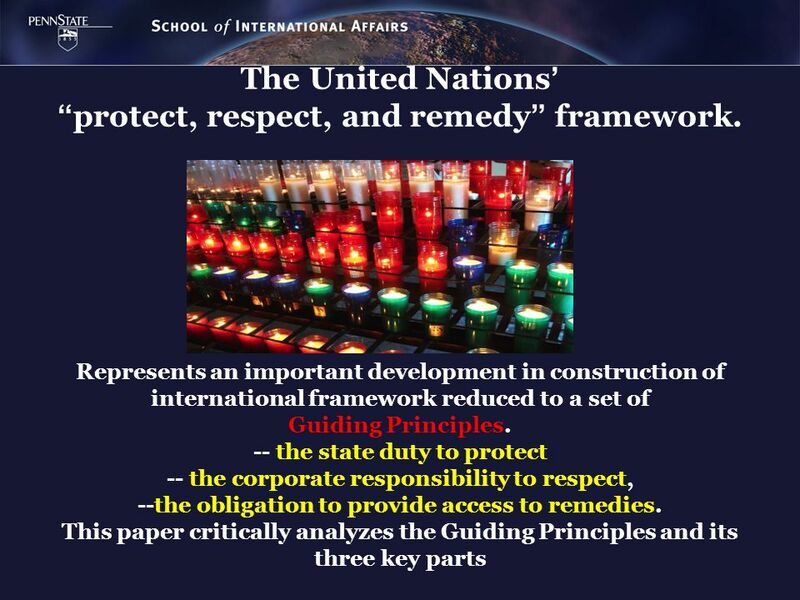 -- We have examined the United Nations “Protect, Respect, and Remedy” Framework as a basis for creating a regulatory environment for issues of business and human rights -- The Framework creates a new form of governing corporations based on an inter-relationship between law enforced by states, business norms enforced by markets and international norms that influence both. Articled as a set of dense principles, and whatever its shortcomings, it has opened a number of significant pathways to development of law and governance frameworks. It accepts that there are formal systems of governance beyond those of the state. 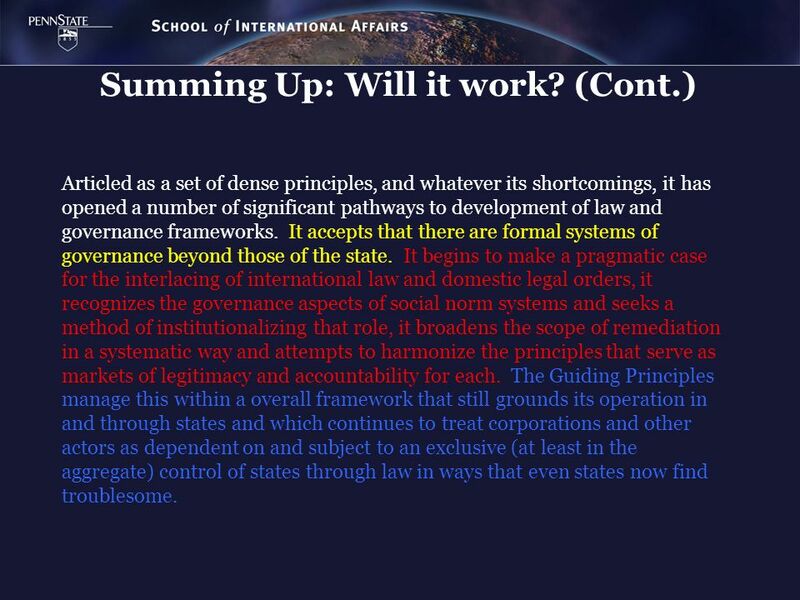 It begins to make a pragmatic case for the interlacing of international law and domestic legal orders, it recognizes the governance aspects of social norm systems and seeks a method of institutionalizing that role, it broadens the scope of remediation in a systematic way and attempts to harmonize the principles that serve as markets of legitimacy and accountability for each. The Guiding Principles manage this within a overall framework that still grounds its operation in and through states and which continues to treat corporations and other actors as dependent on and subject to an exclusive (at least in the aggregate) control of states through law in ways that even states now find troublesome. For the purposes of these guiding principles: The term business enterprise refers to all companies, both transnational and others, regardless of sector or country of domicile or operation, of any size, ownership form or structure. The term corporate is used in the non-technical sense, interchangeably with ‘business enterprises’, regardless of their form. Internationally recognized human rights refers at a minimum to the principles contained in the International Bill of Human Rights (consisting of the Universal Declaration of Human rights and the main instruments through which it has been codified: the International Covenant on Civil and Political Rights and the International Covenant on Economic, Social and Cultural rights), coupled with the eight ILO core conventions that form the basis of the Declaration on Fundamental Principles and Rights at Work. Human rights risks refer to potential adverse impacts on human rights through a business enterprise’s activities or relationships. 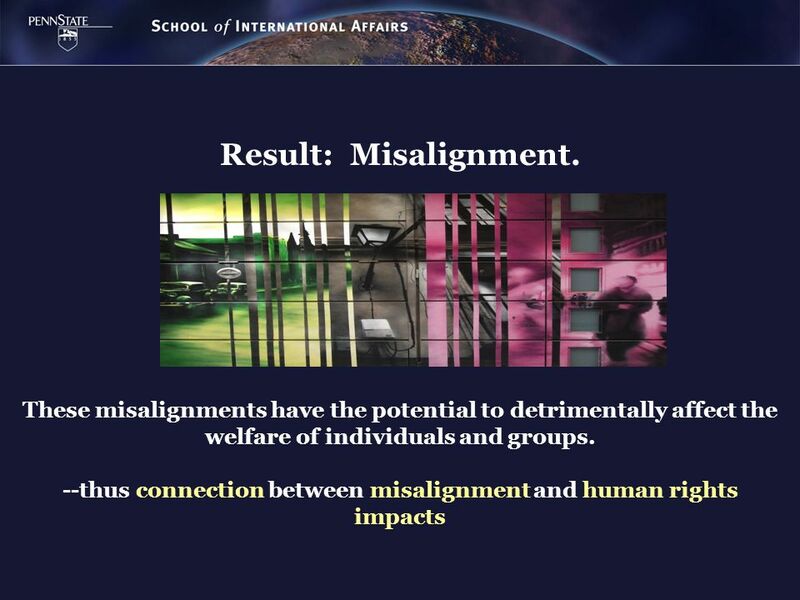 Identifying human rights risks comprises an assessment both of impacts and – where they have not occurred – of their likelihood. A grievance is understood as a perceived injustice evoking an individual’s or a group’s sense of entitlement, which may be based on law, explicit or implicit promises, customary practice, or general notions of fairness of aggrieved communities. The term grievance mechanism is used to indicate any routinized, state-based or non- state-based, judicial or non-judicial process through which grievances related to business abuse of human rights can be raised and remedy can be sought. 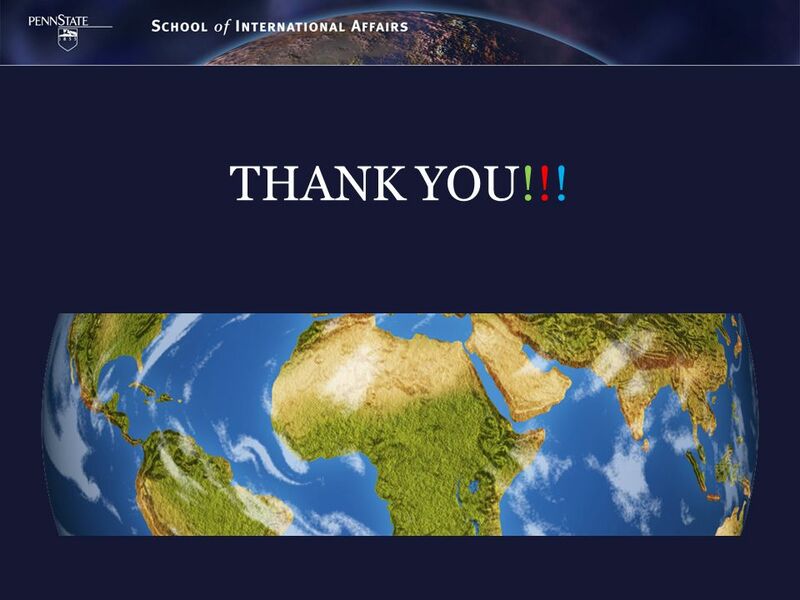 Download ppt "Institutionalizing Global Principles of Business and Human Rights From Institutional Misalignments to Socially Sustainable Governance: The Guiding Principles." 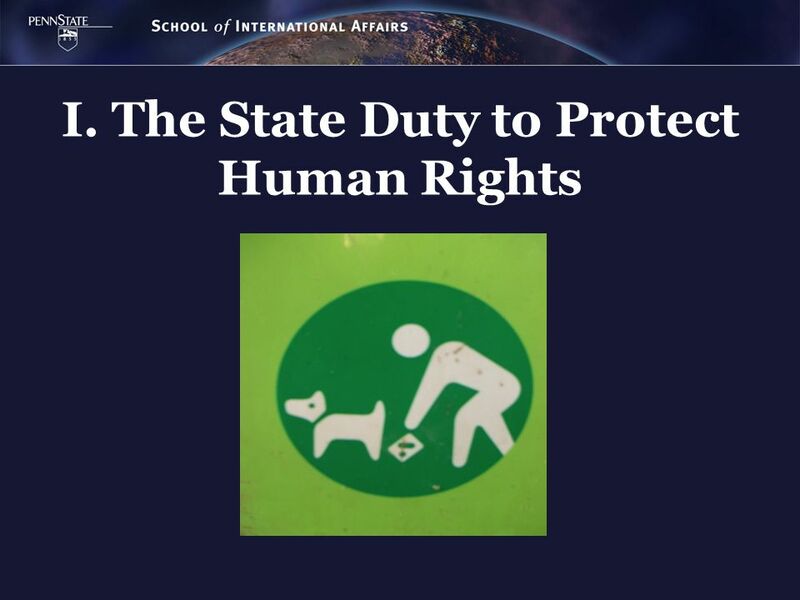 VOLUNTARY PRINCIPLES ON SECURITY & HUMAN RIGHTS. What are the Voluntary Principles? Tripartite, multi-stakeholder initiative Initiated in 2000 by UK Foreign. 1 Trade facilitation: Benefits and Capacity Building for Customs UNECE International Forum on Trade Facilitation, May 2003 Kunio Mikuriya Deputy. CONSULTATION AND THE SAFEGUARD POLICIES ECA Safeguard Training for PIUs, May 17, 2011.